Combining layers lets you merge selected layers to create a new layer. There are two ways to merge layers. 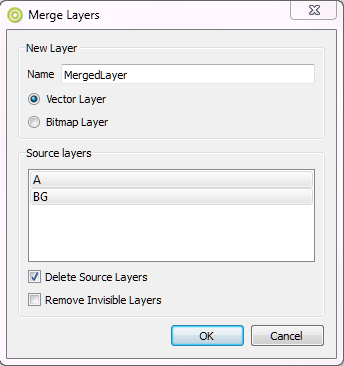 You can merge layers quickly and simply using the Merge Layer command. If all the layers are vector layers, the new layer is vector. If all the selected layers are bitmap, the resulting layer is bitmap. If there is a mix of vector and bitmap, the resulting layer is bitmap. The newly merged layer is editable. Using the Merge Layers dialog box gives you more control when merging layers; you can name the new layer, specify whether it is a vector or bitmap layer, select source layers, and more. Right-click and select Merge Selected Layers or select Layer > Merge Selected Layers from the top menu. Right-click and select Merge Layers or select Layer > Merge Layers from the top menu. ‣ Name: Type a name for the new layer. By default, the name of the layer is MergedLayer. Any newly merged layers will use this name and add a numerical suffix, i.e., MergedLayer_1, MergedLayer_2, and so on. You can draw on top of merged layers, but not modify them. ‣ Delete Source Layers: Deletes the source layers. ‣ Remove Invisible Layers: Removes invisible or hidden layers. This option is available only if the Delete Source Layers option is selected. Whether you decide to delete them or not, hidden layers will not be merged, even if selected from the list. NOTE: To merge a hidden layer, you must first unhide any hidden layers. NOTE: Layers containing 3D objects cannot be merged and will not be listed in the Merge Layers dialog box. After you have merged a layer, it is still possible to edit it. However, any previously defined motion in the source layers will be lost. If you choose not to allow the layer to be edited, transform motion will be kept. For example, if you are using an *.swf file and want to edit its layer, the layer you select will be kept. The rest of the layers will not be part of this layer. ‣ Right-click the merged layer and select Convert to Drawing, or select Layer > Convert to Drawing from the top menu.